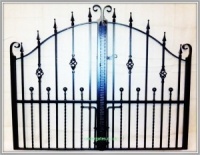 On this page you will find our handmade wrought iron driveway gates, available in a range of designs and finishes with the option for galvanised rust proofing. All of our gates are handmade by ourselves and so can be altered in any way. If you cannot find what you are looking for please contact us. 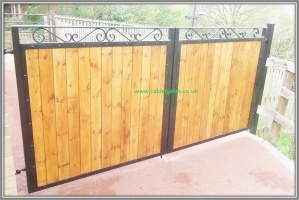 Sherwood metal driveway gate with Knotwood aluminium wood grain effect infill.